Now with 2471 photos online! 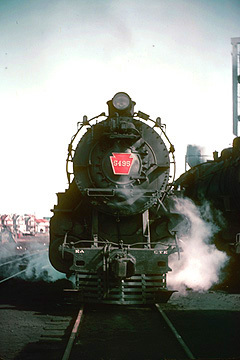 Welcome to the online home for the prodigious railroad photojournalism of John Dziobko, Jr. He took his first photos in 1948. By July 1950 John was shooting Kodachrome slides while the medium stayed mostly black and white for another decade. "I see trains in color, that's how I wanted to preserve them! ", John was once heard to exclaim. Later, he traveled the globe in search of vanishing steam locomotives and their colorful replacements. Those old images live on here.